Pakistan has managed to significantly reduce poverty and rapidly grow its middle class since 2001 in spite of major political, security and economic challenges. The foundation for the rise of the middle class was laid on President Musharraf's watch by his government's decisions to invest in education and infrastructure projects that led to the expansion of both human and financial capital. My hope is that the continued improvement in security situation and implementation of China-Pakistan Economic Corridor (CPEC) related projects will bring in higher long-term investments and accelerate Pakistan's progress toward prosperity for all of its citizens. ha. Why do Pakis bring their own yardstick to make themselves look better. Worldwide there is only one yardstick to judge auto sales -> Sales of new cars. Same is true for every high-end middle-class consumables like Ipad, Hi Def TV. RK: "Worldwide there is only one yardstick to judge auto sales -> Sales of new cars"
The figures I have quoted from Dr. Abdul Ghani are for total cars owned by households, not sales in a given year. India has about 250 million households vs Pakistan's 30 million. At 6% of households, it translates into vs 15 million cars in India vs 1.8 million cars in Pakistan. And these 6% households in either country are not "middle class" by any definition. These figures are for family owned cars, not utility vehicles (UVs), taxis and vans commercially owned and operated. Demand for cars in Pakistan exceeds supply. Over 200,000 cars were produced in Pakistan and another 50,000 imported last year. And car sales in Pakistan are are now rising faster than in India. "Indus Motor, a joint venture between Toyota Motor and local conglomerate House of Habib, is doing well with its mainstay Corolla, reporting that sales grew 11% on the year to 65,000 in fiscal 2016. "The market is so brisk that production can't keep up," said Indus Motor Vice Chairman Toshiya Azuma. Azuma expects even more growth to come. "Demand in India, our next-door neighbor, is about 4 million cars [including commercial vehicles] a year, so annual sales of about 600,000 cars is well within reach in Pakistan." The country has a population one-sixth that of India." Pakistan may have higher percentage but India's population is bigger therefore it has higher quantity in all categories despite lower percentage. Nearly 90% families in China today have a refrigerator. What about India? The 2016 ICE 360° survey showed that a little less than 30% of Indian families have a refrigerator. At first glance, we may conclude that a fridge is still an aspirational product that doesn’t fit into the majority of Indian families’ budgets. That reasoning however, does not hold up. The same survey showed that even in the top 20% of the richest Indian families, only six out of 10 families have a fridge. This suggests that constraints other than affordability are at work here that influence households’ decision to buy a refrigerator. While a threshold level of income is a necessary condition for the purchase of a refrigerator, it is not the sufficient condition. The 2011 census shows that nearly twice the number of households in rural India own a two-wheeler, which costs much more than a fridge. 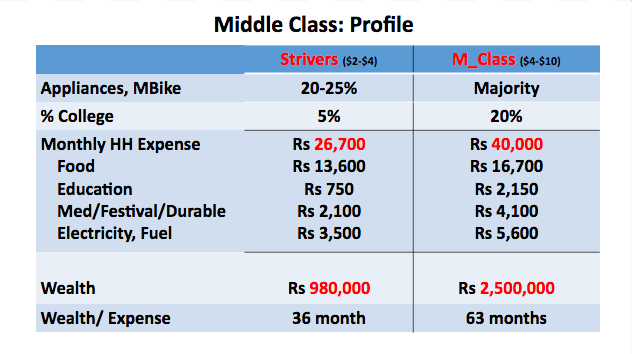 This kind of hierarchical pattern in the ownership of a two-wheeler and a fridge in India is unlike in any other major economy. In a March 2017 paper in the Journal of Quantitative Economics (From Income to Household Welfare: Lessons from Refrigerator Ownership in India, by Sowmya Dhanaraj, Vidya Mahambare and Poonam Munjal), this apparent puzzle is explored. Following a robust statistical methodology and controlling for the impact of a number of other determinants such as regional influences, two factors stood out. One, a refrigerator is unique among all energy-using consumer durables. Unlike the television or air-conditioner, the decision to purchase a fridge depends not only on the access but also reliability and duration of residential power. Unlike a TV, a fridge is of little use unless uninterrupted power supply is guaranteed. Nearly 43% of rural households and 13% of urban households in India either do not have access to electricity, or receive electricity for less than eight hours. This makes it a major constraint to buy a durable such as a refrigerator. In fact, only around half of India’s population receives residential power for more than 16 hours a day. Two, unlike a TV, which is a leisure good, a refrigerator disproportionately benefits women in the family. As a result, a decision to purchase a consumer durable is also driven by their bargaining and decision-making power within a family. And what would tilt the intra-household bargaining power in favour of women? It is largely the function of the education level of women. India generates enough electricity for its population. Please take a note of that. The problem lies in end user connections and the bureaucracy of it. Gujarat solved that problem by improvising a better metering system and now actually exports excess power. After PM Modi's election this system is being adopted nationwide and in 5-10 years a dramatic shift will transform electrification in underserved areas. Fresh data from a large-scale nationally representative survey conducted this year (2016) shows that the washing machine has become a more popular household asset than the computer in India. The ‘Household Survey on India’s Citizen Environment & Consumer Economy’ (ICE 360° survey) shows that 11% households own a washing machine while only 6% own a computer or a laptop. The survey covering 61,000 households is among the largest consumer economy surveys in the country. The home appliances business is thriving and key market players expect consumer demand to surge as households generally replace their old appliances with newer models. According to an assessment, almost all concrete houses in first-, second- and third-tier cities, from posh areas to shanty settlements, have fans. The reach of the television is said to be as high as 80pc. In major cities, almost 60pc of households are said to have fridges and washing machines, on average. And China is reaping the benefit of the changing lifestyle in Pakistan, as the bulk of key components used in home appliances are imported from the Asian giant, leading companies in the business confirmed. According to the Survey, “In electronic products, air conditioners, deep freezers, electric motors, storage batteries and refrigerators were main contributors (to LSM), growing by 36.12pc, 83.03pc, 20.1pc, 3.2pc and 3.6pc respectively”. According to latest PBS figures released on March 24, the production of home appliances — including refrigerators, TV sets, air conditioners and sewing machines — rose 10pc to 1.2m units during July-January 2014-15. The production of the most popular products — fridges and deep freezers — was up 15pc to 0.8m units, against 0.7m units during the same period of the previous year. And the production of television sets — the second most popular category in electronic goods — grew 5pc to 57,000 units during July-January. But air conditioner and sewing machines declined 6pc and 1pc over the period. What's the reality behind all the praise for Pakistan's economy? Underpinning much of the coverage is a set of core statistics: the country’s GDP growth rate crossed 4 percent last year, and is expected to surpass 5.5 percent in 2017. The stock market rose by 46 percent in 2016, and is now in line for an upgrade to emerging market status by the middle of 2017. Foreign exchange reserves have grown to a record high of $20 billion, while more inflows are expected via a number of big-ticket energy and transit projects under the $57 billion China Pakistan Economic Corridor (CPEC). Finally, measurements by the United Nations Development Program (UNDP) show multidimensional poverty declining from 55 percent of all households in 2005 to 38 percent in 2015. Beyond macroeconomic indicators, another factor that has received considerable attention in recent coverage is the country’s growing middle class. One recent piece, published in the Wall Street Journal, cited this burgeoning middle class as the primary fuel behind the twin boon of democratic stability and economic growth. Depending on the definitions used, Pakistan’s middle class is estimated to be anywhere between 5 to 35 percent of the population. Using income-based methods, the Pakistan Institute of Development Economics (PIDE) finds that approximately 55 million people earn between 75 to 125 percent of the overall median income. Credit Suisse, on the other hand, estimates that 9.7 percent of Pakistan’s adult population, around 7 million people, possess wealth between $10,000 and $100,000. By this measure, Pakistan’s would be the 18th largest middle-class in the world. In the absence of reliable data on changes in the income distribution, a number of other metrics serve as a useful way to gauge Pakistan’s "middle-class revolution". 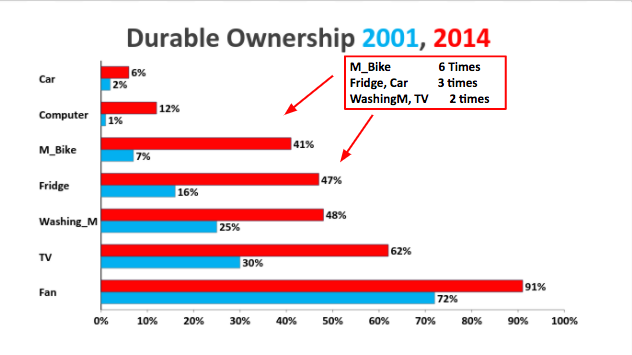 One of these is the ownership of consumer durables: today, approximately 40 percent of all households own a motorcycle while nearly 60 percent own a television, up from 4 and 20 percent respectively in the early 1990s. Similarly, household ownership of washing machines and refrigerators is now in the mid-40s as well, up from under 20 percent just two decades ago. This expanding market for sale of household appliances, along with its untapped potential, has not gone unnoticed by foreign investors. Late last year, the Turkish consumer goods giant Arcelik entered the Pakistani market through a $240 million buy-out of a local white goods manufacturer. Similar expansion at the upper-end of the consumer market can be gauged from the sale of passenger cars, which rose from 40,000 units in 2000 to nearly 200,000 in 2016. A considerable portion of this market is now financed through credit, as banking outlays for the purchase of automobiles hit an all-time high of $1.1 billion in 2016, up from $415 million in 2012. Beyond descriptive statistics, the spatial and visual transformation in Pakistan’s expanding urban centres tell a similar story. Private schools and colleges have cropped up everywhere, offering instruction in the English language as their contribution towards personal enrichment and upward mobility. Similarly, new real estate developments in housing and retail can be found selling profitability and modern amenities to investors and consumers respectively. Advertising campaigns for these projects often rely on some variant of an idealised western lifestyle, clearly playing on, and perhaps in part shaping, the aspirations of a vociferous market. Ravi said: ha. Why do Pakis bring their own yardstick to make themselves look better. Worldwide there is only one yardstick to judge auto sales -> Sales of new cars." Why is it that every time any time statistic is presented that shows India in a negative light Indians start panicking? Why so much inferiority complex? At least one-fourth of urban households in India don't have a separate kitchen, according to recently released data based on the Socio-Economic Caste Census (SECC) carried out by the housing ministry. The survey indicates how nearly 1.7 crore urban households may be using their single room for cooking food as well. This fresh data gains importance considering that different studies have shown how air pollution in kitchens has become a major health concern and that too in urban areas where the ambient air is getting increasingly polluted due to vehicular emission and dust. A recent study published in Elsevier, a journal on environmental research, which assessed people's personal exposure to pollution in Delhi, showed how kitchens can be more polluted than roads. The study mentioned how urban households, particularly kitchens, could be enveloping people in PM 2.5 pollutants as well. Other studies across the globe have also shown how kitchen appliances release colourless pollutants. Kitchens also get more polluted when they lack proper ventilation. In fact, the Pradhan Mantri Ujjwala Yojana (PMUY), launched by PM Narendra Mod, was a big step towards making kitchens smoke-free for women who are often the worst-affected by such pollution. According to SECC data, while Mizoram has the maximum percentage of such households, Bihar ranks second. In Daman and Diu and Kerala, over 90% households have exclusive kitchens. "Confidence of Indians", really? The same Indians Clinton called Rodney Dangerfield of international politics, always complaining that they don't get enough respect? Isn't it time that you guys come back to plant earth? "The hidden truth behind India’s low refrigerator ownership"- I work for Refrigerator Industry at a senior level and can tell you. India's Refrigerator production is in top 6 world wide. It stands more than 20 Million nos per year. It is growing at 30 % YOY. I am sure it will be in top 3 before 2020. Indians do not prefer to store food in Refrigerator (not even vegetables). They use fresh food daily basis. The only use of fridge is in summer and for cooling water. So penetration is very low. This is very good comparison between India and Pakistan. What we can learn from this is both countries are suffering from acute electricity crisis. Per capita consumption of electricity will determine future growth of both the countries. Pakistan had been doing well for decades till 1990s but after that it seems like India has had a better growth story for the past 20 odd years. Dr. Riaz what's your forecast for electricity generation and consumption for India and Pakistan for another 20 yrs. As smartphones flood into the country, more and more Pakistanis switch from feature phones to smartphones. Those who have not yet taken them up haven’t done so majorly due to safety concerns, and not for the lack of inclination towards the new trending gadgets. The share of smartphone continuously rises even more in a market equipped with 3G and 4G, that have 35 million mobile data subscribers. While Apple’s iPhone and the more feature-rich models of Samsung have been favorites among technology enthusiasts and high-income group consumers, low-end models Huawei, Samsung and QMobile are popular because of the reasonable price range they offer. QMobile dominates both smartphone and feature phone markets and holds over 50 % of the smartphone market segment. Last year, Samsung had 20.5% of the smartphone market share while Huawei increased its share from 7.3 % to 8.9%. The prevalence of smartphones among people-powered the growth of businesses like Careem, which, without owning a single vehicle, has become a successful business worth 1 billion US dollars. Smartphones are the market square for businesses today. As they offer technology connectivity, entrepreneurs expect them to be a selling medium for products and ideas. The flourish in smartphones in these recent years has seen to it that Pakistani mobile users do not see the mobile phone as a mere communication device anymore. Besides connecting people, phones are now connecting technologies. The arrival of smartphones has meant that your phone is now a camera, as well as a photo editor, a document scanner, weather forecaster, a tiny portable workstation and much more. Additionally, thanks to new online business and medical technology solutions, this pocketable device promotes health and security, and make traveling, eating, paying bills more enjoyable and simpler experiences. Smartphones have given urban life in the fast lane a boost and profited start-ups and business ventures. It is no wonder that, along with our dependence on these devices, expectations we have from them are rising. Users expect them to provide convenience and solutions in every domain, from health, recreation, and logistics to simplifying daily cumbersome tasks. IDC expects smartphones to overshadow feature phones by end of 2017, even though smartphones currently make up 31% of the mobile market. It seems a huge chunk of our population is steadily adopting to smarter phones. Pakistan is also estimated to have 17 million new mobile subscribers by 2020, TechJuice reports from the GSMA’s 2017 Mobile Economy Report. These trends are indications of increasing technology awareness in our nation. As mobile and smartphone users increase in different income groups, we can expect changes in the lifestyle of entire communities. More and more people will have access to the convenience and technology solutions offered by and through smartphones. The increased number of users bring business opportunities for entrepreneurs that want to use this medium to access a wide base of customers. The PSLM Project is designed to provide Social & Economic indicators in the alternate years at provincial and district levels. The project was initiated in July 2004 and will continue up to June 2015. The data generated through surveys is used to assist the government In formulating the poverty reduction strategy as well as development plans at district level and for the rapid assessment of program in the overall context of MDGs. As such this survey is one of the main mechanisms for monitoring MDGs indicators. It provides a set of representative, population-based estimates of social indicators and their progress under the PRSP/MDGs. For Millennium Development Goals (MDGs), UN has set 18 targets for 48 indicators for its member countries to achieve by 2015. Pakistan has committed to implement 16 targets and 37 indicators out of which 6 targets and 13 indicators are monitored through PSLM Surveys. The PSLM surveys are conducted at district level and at Provincial level respectively at alternate years. PSLM District level survey collects information on key Social indicators whereas through provincial level surveys (Social & HIES) collects information on social indicators as well as on Income and Consumption while in specific sections also information is also collected about household size; the number of employed people and their employment status, main sources of income; consumption patterns; the level of savings; and the consumption of the major food items. However, Planning Commission also uses this data for Poverty analysis. An other important objective of the PSLM Survey is to try to establish the distributional impact of development programs; whether the poor have benefited from the program or whether increased government expenditure on the social sectors has been captured by the better off. The sample size of PSLM surveys district level is approximately 80000 households and approximately 18000 at Provincial level. So Pakistan where even cities have notorious blackout has more refrigerator ownership? This is strange. Is it because more meat consumption and Indians buy vegies from corner bazars every day? I doubt power supply has anything to do with this. Either survey was not correct, or something other than power supply issue. I think Pakistani being more wealthy in general has to with more resources as well. Isn't it true that 50% Pakistan live in Punjab. That is the most resource rich area in subcontinent. How many battles were fought for that land? Also growth wise Pakistan beat india for about 50 years, there itself cumulative effect will be tremendous. Why does Riaz thinks that everybody in India is not aware of Pakistan's relative wealth? Also is Pakistan like Kerala? I think percentage of Pakistanis per household working abroad must be considerably high. What are the remittance flow in India / Pakistan. I bet Pakistan per person is multiple of India. Kerala has communist ruining industry but somehow average Karalite is richer, more educated and better in every other HDI than most Indians. IMF and World Bank data shows a better Indian per-capita picture. Of course the question is, what is the size of a household in Pakistan and in India? The corresponding sizes are 6.7 & 4.8 persons or Pakistani household is 40% bigger than an Indian household. Julian: "IMF and World Bank data shows a better Indian per-capita picture"
The average in India is heavily skewed by highly unequal distribution of income and wealth in India. Top 1% of Indians own 58.4% of wealth. Pakistan does significantly better than India when comparing mean income and wealth. As to the household size, the mean in Pakistan is 6.2 person for 2014-15, according to PSLM. Pakistan has a younger population than India. The proportion of car-owning households in the country was 5%, according to the 2011 census data. That proportion has more than doubled, and stands at 11% today as per the ICE 360° survey 2016. The proportion of two-wheeler owners has increased 15 percentage points to 36%, while the proportion of bicycle owners has increased 13 percentage points since 2011 to 58%, the survey shows. If you don't believe in India's growth then don't invest. Simple. There are plenty who want to locally and internationally. Pakistan is determined to funnel more money toward infrastructure, small businesses and the poor, and the government has found an array of international partners to make it happen. Finance Minister Ishaq Dar recently spoke with The Nikkei about Pakistan's development drive and the federal budget for the coming fiscal year through June 2018, which he said will focus on generating 6% gross domestic product growth. Speaking about the budget to be announced on May 26, Dar said: "After [achieving] macroeconomic stability, we have fully focused on higher GDP growth that brings a better life to people, better per capita income, job opportunities and fills the gap in infrastructure demand." FUNDING DEVELOPMENT Dar pointed to a recent agreement with the World Bank-affiliated International Finance Corporation to set up a Pakistan Infrastructure Bank. The bank will provide financing for infrastructure projects undertaken by the private sector, he said, describing the new lender as an "equal partnership by the Pakistan government and IFC for 20% each." Other stakeholders from around the world will account for the rest, he said. The bank is expected to have paid-up capital of $1 billion. And the infrastructure bank is just one piece of the puzzle. "With partnerships with the U.K.'s Department for International Development and the German government-owned development bank KfW, we have created the Pakistan Microfinance Investment Co.," Dar said. Its three-year business plan calls for boosting the number of "beneficiaries of microfinance from the current 4 million to 10 million." The government, the U.K. aid agency and KfW are teaming up to create the Pakistan Poverty Alleviation Fund. Pakistan will hold 49% of the fund, with the U.K. and German partners holding 37% and 14%, respectively. Islamabad has also established the Pakistan Development Fund, which will invest in public-sector projects outside the budget. The government's initial investment comes to $1.5 billion. As for the economy, Dar said the government is "hoping for over 5% growth" for the current fiscal year, noting that the "World Bank is projecting 5.2% in 2017 and 5.5% in 2018." Looking ahead, he suggested 6% growth is possible for next fiscal year, and that it could reach 7% the following year. "Our GDP is reportedly underestimated by 22-25%. If [the reported growth rate for] fiscal 2017-18 is 6%, it will be actually 7% or more," Dar said. According to Dar, an old method of calculating national output is responsible for the discrepancy. "It has to be upgraded," he said. "And businesses, especially small and medium-sized businesses, have not been [brought into] the database on which GDP is calculated over 10 years." To paint a more accurate picture, Dar said he recently "authorized the World Bank to carry out a study, and they will take one year." UNDAUNTED BY DEFICITS Although Pakistan has had success containing inflation and attracting foreign direct investment, its fiscal and current-account deficits are a risk factor. Dar, however, disputed that, saying: "The fiscal deficit is not an issue. From fiscal 2012-13 to 2015-16, we cut the fiscal deficit from 8.8% to 4.6% of GDP. This fiscal year, we expect it will be close to 4.1%." Dar chalked up the deficit to two major budget items. One is infrastructure development. "We see a jump from 600 billion rupees ($5.73 billion) in fiscal 2012-13 to 1,600 billion rupees in fiscal 2016-17." military organisation vital to Beijing’s oil and security policies which also dominates the agricultural economy of the frontier region of Xinjiang. China wants to complete four main tasks via CPEC: expand the Gwadar port on Pakistan’s south coast, which it financed, built and owns, build a fleet of power plants, construct road and rail links and set up special economic zones where companies can enjoy tax breaks and other business incentives. In building infrastructure, Beijing is doing for Pakistan what Islamabad has been unable to do for itself, especially as far as power generation is concerned. Peak electricity demand in Pakistan is 6 gigawatts greater than it can generate — equivalent to about 12 medium-sized coal power plants. Blackouts in many parts of the country last for several hours a day. To meet this shortfall China is expected to spend more than $35bn — about two-thirds of the entire CPEC budget — building or helping to construct 21 power plants, which will be mainly fuelled by coal. The combined 16GW of capacity that they could provide would repair Pakistan’s supply gap twice over. The building work associated with CPEC has already boosted heavy industry in the country. Arif Habib, one of the country’s biggest business conglomerates, says it is trebling its cement production in anticipation of CPEC. The Chinese plan, revealed by Dawn newspaper to have been delivered in December 2015, has only added to those concerns. It talks about thousands of acres of agricultural land leased out to Chinese enterprises to develop seed varieties and irrigation technology. It would install a full system of monitoring and surveillance in cities from Peshawar to Karachi, with 24-hour video recordings on roads. It would build a national network of fibre-optic cables to boost internet access. Key to this is the XPCC. Under the plan the Han Chinese economic and paramilitary organisation is mandated to invest in Pakistan as a springboard for economic development around Kashgar, the heartland of 11m Turkic-speaking Muslims known as Uighurs. Ministers in Islamabad say the document contains proposals originally drawn up by Beijing, but will not say how far the draft agreements, which are still being negotiated, differ from it. Whatever the concerns in Pakistan that Islamabad is ceding too much power to China, many in the business and political communities argue that the benefits from the infrastructure projects are well worth it. “Pakistan requires money and money has no colour,” Kimihide Ando, head of Mitsubishi Corp in Pakistan, says. For the fiscal ended March 2017, domestic passenger vehicles (PV) sales were at 30,46,727 units against 27,89,208 in the previous year, according to data released by the Society of Indian Automobile Manufacturers (SIAM). “In terms of passenger vehicles, we crossed the three million mark for the first time,” Sen told reporters here. “The growth in PV sales is driven largely by demand for utility vehicles ahead of sedans and hatchbacks,” he added. During the year, utility vehicle sales were at 7,61,997 units against 5,86,576 units in the previous fiscal, a growth of 29.91 per cent. “This is the highest growth rate achieved by the UV segment after 2013-14 when it grew by 52 per cent,” Sen said. Domestic car sales during the year grew 3.85 per cent to 21,02,996 units from 20,25,097 units in the previous year. This was the lowest growth since 2014-15, when car sales rose 5.09 per cent. Maruti Suzuki’s Vitara Brezza, Hyundai’s Creta, Renault Duster, Mahindra Scorpio and Ford Ecosport are among the popular SUV models in India at present. “As for demonetisation, the impact was for only two months on the PV segment and recovery was quick, but it was prolonged in the two-wheeler segment,” he said. In 2016-17, market leader Maruti Suzuki India retained its top position in the domestic PV space selling 14,43,641 units, a growth of 10.59 per cent. Rival Hyundai Motor India was a distant second with 5,09,705 units, up 5.24 per cent followed by home-grown Mahindra & Mahindra in the third spot with 2,36,130 units, down 0.07 per cent. Total two-wheeler sales during the year stood at 1,75,89,511 units against 1,64,55,851 in the previous fiscal, up 6.89 per cent. Motorcycles sales in 2016-17 were at 1,10,94,543 units compared with 1,07,00,406 in the previous fiscal, up 3.68 per cent. Market leader Hero MotoCorp sold 56,93,681 units during the year compared with 56,03,136 in the previous fiscal, up 1.62 per cent. Rival Bajaj Auto posted sales of 20,01,391 units against 18,98,957 in 2015-16, up 5.39 per cent. Honda Motorcycle and Scooter India (HMSI) had bike sales of 15,36,055 units last fiscal against 14,94,153 units in 2015-16, a growth of 2.8 per cent. Chennai-based TVS Motor Co posted a growth of 6.81 per cent in its domestic scooter sales at 8,26,291 units against 7,73,597 units sold in the previous fiscal, becoming the number two player in the category. Hero MotoCorp dropped to third position with its scooter sales last fiscal at 7,89,974 units compared with 8,18,777 units in 2015-16, down 3.51 per cent. SIAM said that during 2016-17, commercial vehicle sales grew 4.16 per cent to 7,14,232 units from 6,85,704 a year earlier. The retail sector seems to be priming the economic pump. As per latest data released by the Pakistan Bureau of Statistics, the overall output of the large-scale manufacturing (LSM) index grew by 5.69 percent in Jul-May FY17. (For more on LSM going forward, please read “L-S-M!” published August 2). Among the top-three growth industries in the FY17 LSM index is ‘electronics’ – the other two being ‘iron and steel products’ and ‘automobiles’. Having a roughly 2 percent weight in the LSM index, the electronics industry grew by a recent high of 16.18 percent year-on-year in 11MFY17. The key electronics items illustrated in the graph have all grown between FY11 and FY16. However, the growth in refrigerators and air-conditioners has been the most prominent. In the more recent period, there is double-digit growth all around, except for the TV sets. During 11MFY17, production of deep freezers grew by 28 percent, refrigerators 24 percent; electric fans 21 percent, and air-conditioners 10 percent, on a year-on-year basis. In tandem with growth in domestic retail, the production of major electronics items is expected to continue its recent growth run. The middle-class, both its existing members and aspirants, tend to drive the purchases of white goods and electronics. If the economic growth gathers pace, the resulting higher per capita income will push the sales of both lifestyle and convenience products. Already, there is an apparent proliferation of housing schemes in both major and small cities – a sign of upward mobility – that is also a driving factor in appliance sales. While folks want comfortable lifestyles, not many households currently have that. As per Euro monitor, in 2016, mere 55 percent of households had a washing machine, 43 percent had a refrigerator, 20 percent had a microwave oven, and 16 percent had a deep freezer. There is obviously potential there, more so in rural areas where ownership of household durables is markedly lower than urban areas. Continued flows of remittances and growth in farming incomes are going to be driving forces for electronics sales. But who will feed all that demand? While almost all of the demand for electric fans and refrigerators is being met through local production, the same is not the case for air conditioners, LED TV sets, deep freezers, and washing machines. The domestic players are conscious of the need to invest in product design, functionality, and quality of service. But the price-conscious mass market doesn’t encourage them to really go the extra mile, thus hampering their ability to compete with the imported products. I'm a student of Applied Psychology, currently working on my own research. I'm having trouble to find the current classification of monthly income to measure socioeconomic status into the class differences. I need them with authentic reference according to economics survey of Pakistan or Pakistan bureau of statistics. I wonder if you could me help. Ayesha: "I'm having trouble to find the current classification of monthly income to measure socioeconomic status into the class differences. I need them with authentic reference according to economics survey of Pakistan or Pakistan bureau of statistics." 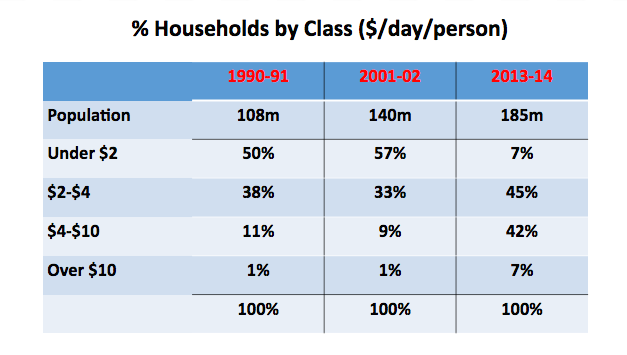 Classes like rich, middle and poor are usually defined in terms of household incomes, not individuals. The data collected is in terms of income quintiles (20%) of households. You can also see the work of Dr. Jawaid Abdul Ghani of Karachi School of Business on this subject.